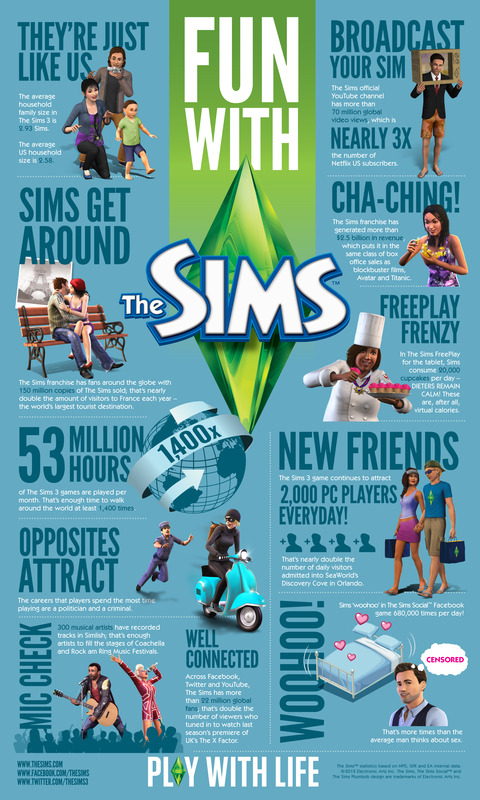 February 4 marks the 12th birthday of EA's blockbuster The Sims franchise and to celebrate the publisher has unveiled a massive infographic proving that people need to get out more. There's no denying that The Sims is a huge phenomenon in gaming. Originally crafted by gamer demigod Will Wright, the series has pulled in more than $2.5 billion in revenue over the past decade-plus, single-handedly catapulting EA from "incredibly wealthy" to "mind-bogglingly stupid-rich." Of course, that's just one of the pertinent numbers the megapublisher included in this morning's information deluge. Want more? Have a look at the huge infographic I've attached at the bottom of this post. 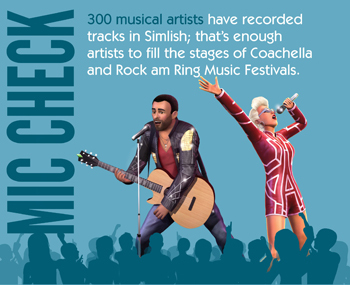 Highlights from the oversized image include the amount of time fans spend playing various iterations of The Sims each month (53 million hours), the frankly baffling number of musicians who have recorded tunes in the game's untranslatable, proprietary Simlish language (300) and the fact that the series' official YouTube channel has nearly three times as many subscribers as internet-darling Netflix. While I'm sure that alarmist breeders will decry this massive, ongoing outpouring of affection for The Sims as some kind of anathema against the natural order -- "People should be raising real families, not playing with virtual dolls," they exclaim, frustrated because their stupid, ugly babies spent the entire night prior weeping and vomiting on nearby objects -- but being a progressive twentysomething who uses terms like "breeders" in the extreme pejorative, I applaud humanity's drive to avoid any semblance of actual responsibility. Raising a family in reality is a whole lot of work, and society gets really upset if you attempt to reenact Poe's Cask Of Amontillado with your newborn child. If nothing else, propers to EA for facilitating our over-educated sociopathy for the past 12 years.